Good morning, PinkWhen readers! Justine from Cooking and Beer here to get all summery on you. If there’s one thing I go crazy for once the weather starts to warm up, it’s fresh veggies. I am kind of a garden nut, and while we don’t have the perfect climate for growing some of my favorites, I do the best that I can. Snap peas and green beans are two veggies that I ALWAYS grow. Obviously, these two haven’t even begun to sprout yet, but it still doesn’t mean I haven’t been stocking up at the market! 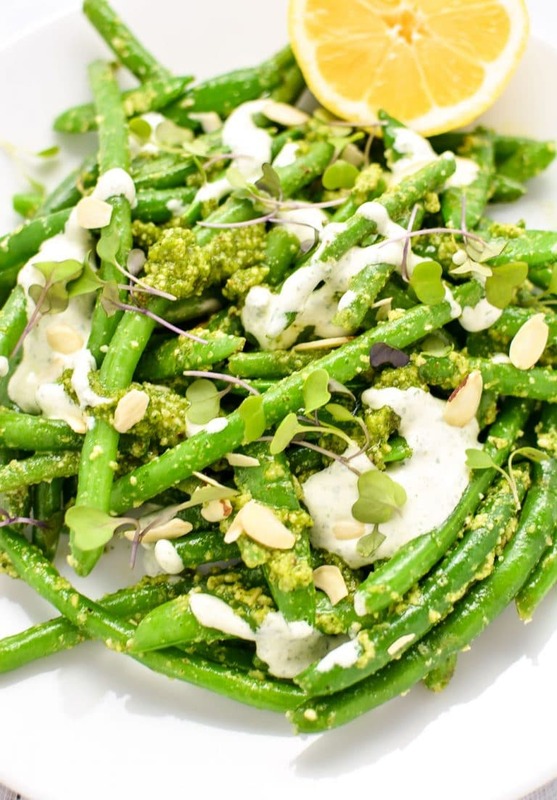 This snap pea and green bean salad with arugula pesto is summertime freshness on a plate. 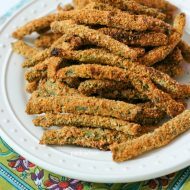 It’s the perfect side dish for all of your outdoor gatherings! 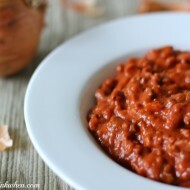 I think what I love most about this recipe is that it tastes great served warm or chilled. I absolutely love when a dish can be both. It’s the perfect recipe for a potluck because it’s one you can make way ahead of time, which I just love. I also love how diverse you can get with this recipe. 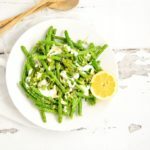 I used snap peas and green beans because the two happen to be my two of my favorite veggies, but you can use just about anything fresh and crisp. Broccoli is the perfect substitute and if I can get my hands on wax beans, I usually use those too. 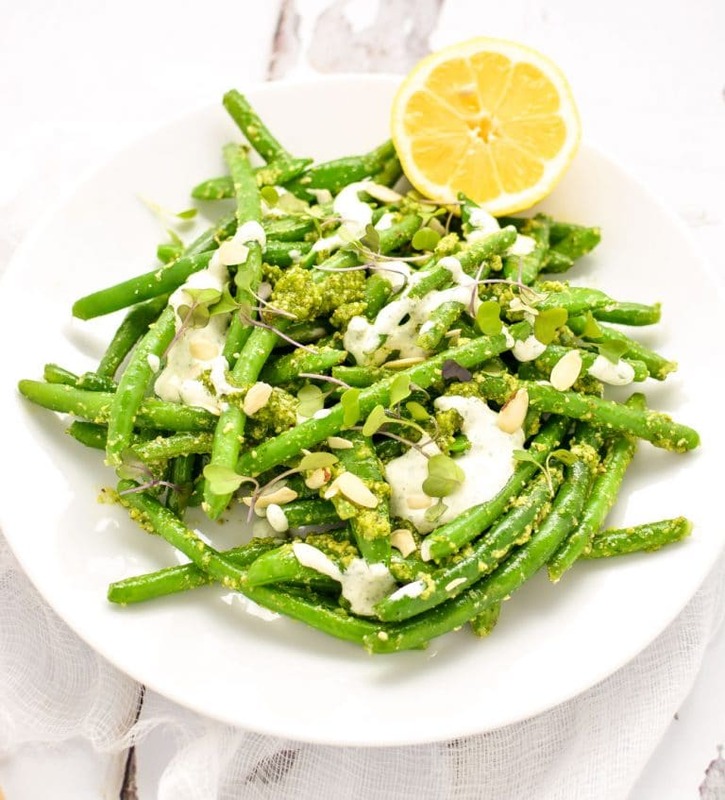 The arugula pesto really compliments the fresh veggies with it’s nutty and lemony flavor and the cilantro cream gives you a refreshing burst of cilantro. This salad is perfect for a weeknight side dish or an outdoor picnic. It’s so simple to make and ready in under 30 minutes. 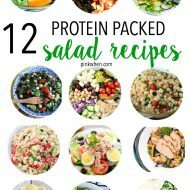 In the summertime, where all I want to be is outside basking in the sunshine, I like to be out of the kitchen quickly, and this recipe allows that kind of freedom! A simple arugula pesto is made by combining both almonds and pistachios in the bowl of your food processor. Two large handfuls of arugula, a couple of basil leaves, raw garlic, and lemon zest are pulsed in with the nuts. The extra virgin olive oil brings it all together. Toss the snap peas and green beans in this pesto and top it with a simple blend of cilantro and yogurt. You should probably just make two huge batches. You’ll probably need both of them! 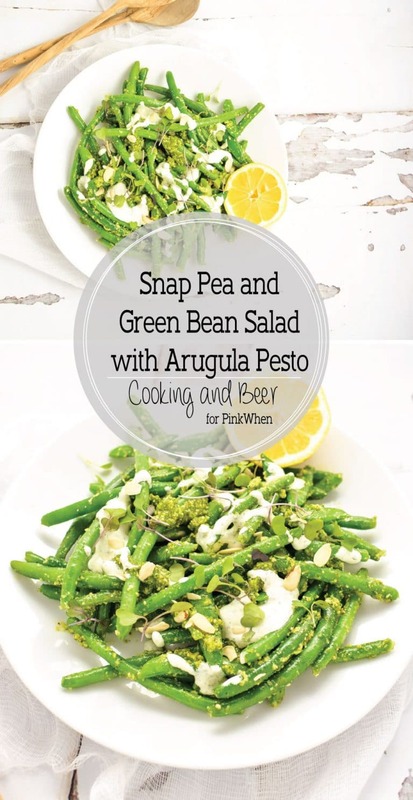 Recipe for this snap pea and green bean salad with arugula pesto is below! Enjoy! 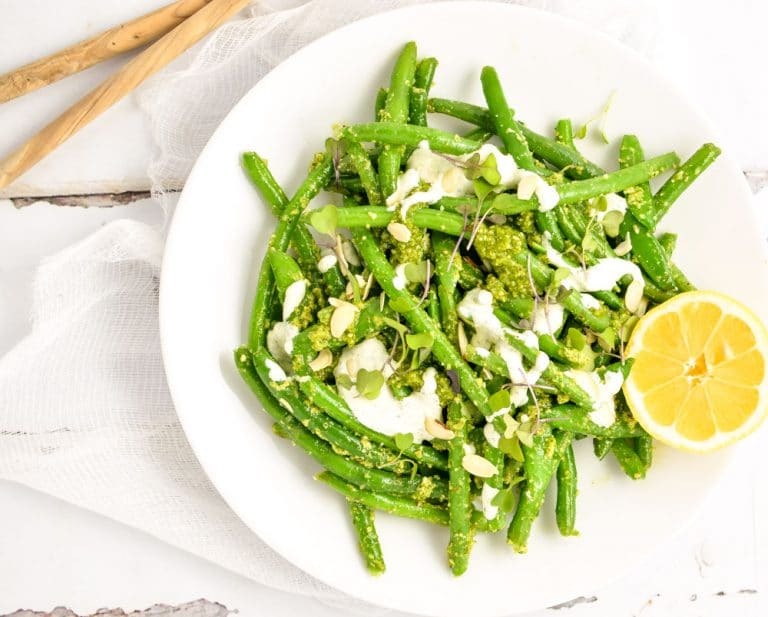 A delicious and easy side, your family and guests will love this snap pea and green bean salad with arugula pesto. While your water is coming to a boil, prepare your arugula pesto and cilantro cream drizzle. In the bowl of your food processor, add the almonds, pistachios, garlic, lemon zest, baby arugula and basil leaves. Pulse 8-9 times until completely broken up. With the food processor running, slowly pour in the olive oil until the pesto just comes together. Season to taste with salt and black pepper and transfer to a large bowl. In the same food processor bowl (wipe clean if you wish), combine the yogurt and cilantro. Pulse until the two ingredients come together. Season to taste with salt and black pepper and set aside. Have an ice bath ready. Add the snap peas and beans to the boiling water and blanch for about 1 minute and 30 seconds. Drain and transfer immediately to the ice bath to cool down. Drain again once the veggies are cool, and pat them dry. Add the veggies to the bowl with the pesto and toss to coat. Pour the veggies onto a large platter and drizzle with the cilantro cream. Top with micro greens and sliced almonds. Enjoy immediately or place in the refrigerator to chill. This salad may be served either warm or chilled.